Coffee House Press, 9781566891417, 517pp. When a restaurant review referred to a Filipino child as a "rambunctious -little monkey," Filipino Americans were outraged. 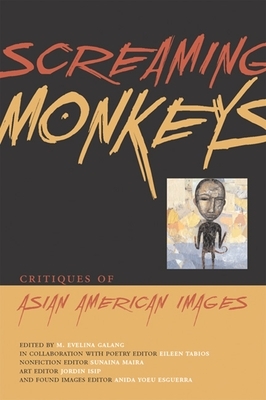 Sparked by this racist incident, Screaming Monkeys sets fire to Asian American stereotypes as it -illuminates the diverse and often neglected history and culture within the Asian American diaspora. Poems, essays, paintings, and stories break down and challenge "found" articles, photographs, and headlines to create this powerful anthology with all the immediacy of social protest. By closely critiquing a wealth of material, including the judge's statement of apology in the Wen Ho Lee case, the media treatment of serial killer Andrew Cunanan, and the image of Asian Americans in major U.S. marketing campaigns, Screaming Monkeys will inspire all its readers.